INTRODUCTION: A lack of social consensus on the duty to comply with a patient's request to forgo treatment was reported in Italy, but little is known about the nurses' attitudes regarding this issue. MATERIALS AND METHODS: Questionnaire including two clinical scenarios regarding doctor's decision to not comply with a competent patient's request to forgo treatment was administered to all nurses (n = 487) of an Italian medium-sized hospital. RESULTS: Eighty-five percent of nurses completed the study. Although 83% of participants supported a general right to self-determination, around 40% of them agreed with the doctor's decision in both scenarios. The multivariate analyses adjusted for gender, age, length of professional experience, and care setting showed that the agreement with the doctor's decision was significantly associated with nurses' personal background beliefs about self-determination and quality of life. DISCUSSION AND CONCLUSIONS: Many nurses have difficulty in accepting a patient's request to forgo treatment. Increasing ethical reflection and discussion at both educational and professional level, and introducing ethical consultation services would be essential to develop a consistent approach to end-of-life decisions in Italian hospitals. Treatment refusal is generally considered by both ethical codes and legislations in most western state countries, which usually fully recognize the right of a competent patient to refuse any unwanted treatment. However, it can be difficult for nurses and other health professionals to accept a patient's decision to refuse treatment that could potentially save their lives . In those instances, healthcare providers may face a moral dilemma between the respect for patient autonomy and their duty of care for that patient [2-4], especially when they consider the patient's decision not based on "good reasons" [5, 6]. Furthermore, it was argued that "latent medical paternalism may come to the surface when doctors are asked by patients to follow a course of action which is in conflict with their own perspective" . In Italy, specific legislation on patient's consent to treatment is still lacking, but according to the article 32 of the Italian Constitution "no one can be compelled to undergo any certain medical treatment except as a specific provision of the law" . Moreover, in 2001 Italy ratified the European Convention on Human Rights and Biomedicine, which establishes that "an intervention in the health field may only be carried out after the person concerned has given free and informed consent to it", and "the person concerned may freely withdraw consent at any time" (article 6) . Consistently, the 2006 version of the Italian Code of Medical Ethics stated that in the presence of a valid refusal of a competent person the physician should desist from any diagnostic or curative activity , and the Italian Ethical Code of Nurses affirmed that "nurses defend the patients' will to limit interventions that are not proportional to their clinical conditions and consistent with their declared conception of the quality of life" . However, a lack of social consensus on the duty to comply with a patient's request to forgo treatment came to light in Italy in late 2006, when Piergiorgio Welby, a quadriplegic man dependent on continuous artificial ventilation, asked to have the ventilator discontinued while under sedation. Following his attending physician's denial to terminate life-sustaining ventilator , the patient's request was also rejected by the Court of Rome, stating that, although patients have the constitutional right to refuse treatment, no doctor is obliged to respect such refusal . After Welby's death, the anaesthetist who finally carried out his wishes was charged with "consensual homicide", but in July 2007 he was acquitted because the judge admitted that the patient's right to refuse any unwanted medical treatment positively counterbalances the clinician's duty to safeguard the patient's life . Actually, the "Welby affair" reflected the lack of consensus among Italian physicians about their obligation to comply with a patient's request to forgo life-sustaining treatment. Indeed, findings from the EURELD project revealed that 38% of Italian physicians did not believe that "physicians should comply with a patient's request to withhold or withdraw life-sustaining treatment" . Furthermore, as compared to other European countries, Italian physicians were found to be less supportive of patients' involvement in end-of-life decisions [16-19]. On the other hand, little is known about the extent to which Italian nurses, who are expected to carry out physicians' decisions to stop or continue treatments, agree with physicians' views. As a strong association between professionals' attitudes towards end-of-life decisions and professionals' practices regarding end-of-life care has been reported , an exploration of nurses' attitudes may be important for both clinical practice and public health. Indeed, the lack of an interprofessional agreement about what is "right to do" in case of treatment refusal may result in both conflicts within the healthcare team about what to do and inconsistencies in patient care. We acknowledge that addressing this issue may appear unnecessary, and even quite bizarre, for many readers from countries in which legislation established that breaking a competent patient's right to refuse treatment would result in a charge for assault/battery. We hypothesized that this may be one of the reasons for the little empirical research about nurses' attitudes with regard to this issue in recent years. On the other hand, investigating this issue may be important for readers from several countries in which patient autonomy does not hold a position of preeminence due to a lack of specific legislation on patient consent to treatment and/or a particular historical and cultural heritage. The aim of this study was to explore Italian hospital nurses' attitudes towards a doctor's decision to not comply with a competent patient's request to forgo essential treatment. An additional aim was to investigate whether nurses' attitudes were influenced by personal and professional characteristics and by some background beliefs. This report is part of a larger exploratory survey aimed to explore nurses' views and attitudes towards end-of-life decisions and patient autonomy in the context of a medium sized Italian hospital. The study was carried out at a medium-sized (i.e. a hospital that had between 300 and 700 beds) general hospital of an Italian provincial capital in central Italy. All nurses who provided direct inpatient or outpatient assistance (n = 487) were invited to fill in an anonymous questionnaire developed for the study. Participants were asked to complete and return the questionnaire in one week, dropping it in a box. A multidisciplinary working group, including nurses, an expert in research methodology, and a psychologist expert in end-of-life dynamics, developed the questionnaire, which was reviewed by an anaesthetist experienced in pain management and palliative care. The questionnaire was pre-tested by 40 nurses working in another hospital, located in the same region as that of the study. Each item that was uncertain, unclear or that lent to an irrelevant interpretation was eliminated, leading to 23 items (the value of the Cronbach alpha for the final version of the questionnaire was 0.88). The present study presents only a subset of the items. 1. E. is a 90-year-old man who, since the age of 80, was bedridden and resident of an assisted living facility due to a disability. He had pneumonia many times, and antibiotics were considered still somewhat effective for his current pulmonary infection. However, the patient has asked the doctor not to use treatment, as he wishes for the illness to take its course. After reviewing the case, the doctor decides not to comply with the patient's wishes, and continues with all ongoing treatments. 2. C. is a 30-year-old quadriplegic man compelled to live in a condition of total dependence, needing continuous assistance. Due to his unstable clinical condition, he is subject to extensive parenteral treatments. C. asks the doctor to withdraw all treatments. After reflecting, the doctor decides to continue with treatments. The first scenario was based on findings disclosing the high rate of patients who would refuse antibiotics in case of severe physical disability , whereas the second scenario was inspired by the leading case of Elizabeth Bouvia, to whom the Superior Court of Los Angeles County recognized the right to refuse any medical treatment . In both scenarios patients were depicted as fully competent, treatments were not futile, and the outcome of refusal would be likely death. Four further statements explored, on a similar four-point agreement scale, nurses' background beliefs about: 1. factors that could influence their professional behaviour ("in my professional practice, others' behaviour influences my own", and "a nurse's personal values may influence the care provided at patient's endof-life"); 2. personal autonomy ("people have the right to decide for themselves, not just regarding pathological issues, but for all events that may change their life plans"); and 3. importance of quality of life ("quality of life should be the main criterion in decision-making regarding withdrawing treatment"). We decided to investigate these background beliefs on the basis of their potential influence on nurses' attitudes showed by the relevant literature [2, 22-25]. Finally, demographic (gender, age) and professional characteristics (length of professional experience, care setting) were collected. The study was reviewed and approved by the nursing management of the hospital. Coupled with questionnaires, participants were given written information on the study aims. Participation was voluntary, and confidentiality was ensured. To guarantee anonymity of respondent, no personal identification was used, and only aggregated data are shown. Usual descriptive univariate statistics are presented. Participant's responses to Likert scale questions were dichotomized into two categories: "disagree" (Strongly Disagree/Disagree) and "agree" (Agree/Strongly Agree). To show the associations between attitudes and beliefs of the respondents, separate logistic regression models for the two scenarios were fitted. The models were adjusted for gender, age, length of professional experience, and care setting. Complete-case analyses were performed. Analyses were conducted using STATA 12.0. Four hundred and thirteen nurses (85%) returned the questionnaire. Table 1 details participants' characteristics, attitudes and beliefs. Missing information for nurses' attitudes and beliefs ranged from 1 to 6; no missing occurred for the other variables. Of the 413 participants, 114 (28%) were men. The mean age was 40.7 years (SD 8.5, range 23-60), and the mean professional length of experience was 16 years (SD 8.5, range 1-41). One hundred and seven nurses (26%) worked in the medical area, 115 (28%) in surgery, 110 (26%) in critical care, 36 (9%) in paediatrics, and 45 (11%) in outpatient services. Regarding nurses' attitudes, 164 (40%) and 177 (43%) nurses agreed with the doctor's decision in scenario 1 and scenario 2 respectively. 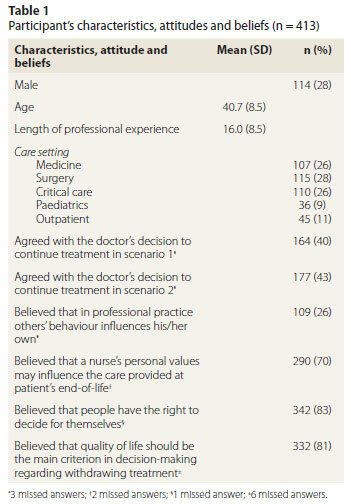 Concerning their beliefs, 109 participants (26%) agreed that in professional practice others' behaviour influences their own, and 290 (70%) that nurse's personal values may influence the care provided at patient's end-of-life. Three hundred and forty-two (83%) and 332 (81%) nurses agreed that people have the right to decide for themselves and that quality of life should be the main criterion in decision-making regarding withdrawing treatment, respectively. Crude and adjusted (confounding factors considered: gender, age, length of professional experience, and care setting) odds ratios (ORs) are reported in Table 2 in order to show associations between nurses' background beliefs and the agreement with doctor's decisions. The doctor's decision was in both scenarios more supported by nurses who believed that in their professional practice others' behaviour influences their own (adjusted ORs 2.24 and 2.01, respectively), whereas it was less supported by nurses who agreed that people have the right to decide for themselves (adjusted ORs 0.17 and 0.23, respectively), and by those who considered that quality of life should be the main criterion in decision-making regarding withdrawing treatment (adjusted ORs 0.32 and 0.37, respectively). The main finding of this study was that, although 83% of hospital nurses supported a general right to self-determination, around 40% of them agreed with the doctor's decision to not comply with a competent patient's request to forgo treatment. The agreement with the doctor's decision was significantly more likely to be displayed by nurses who did not acknowledge a general right to self-determination, by those who did not believe that quality of life is a main criterion in withdrawing treatment decision-making, and by those reporting to be influenced by others' behaviour. Participants in our survey were, on average, experienced nurses from all hospital care settings, and their high response rate suggested a keen interest in the study questions. The rate of nurses who agreed with the doctor's decision to continue treatment was in line with previous data on the Italian physicians' willingness to comply with patient's request to withhold/withdraw life-sustaining treatment. Indeed, as above mentioned, the EURELD project disclosed that 38% of Italian physicians did not believe that "physicians should comply with a patient's request to withhold or withdraw life-sustaining treatment" . This suggests that, despite the deontological and juridical acknowledgement of the patient's right to limit treatment, difficulty in accepting patients' decisions to forgo treatment is common within healthcare professionals in Italy. As already noted, there is little recent empirical research for comparisons. Dawe et al. exploring beliefs and experiences of nurses concerning incurable or terminally ill patients in Alberta, found that almost all participants acknowledged that patients should legally be able to request that life-sustaining treatment may be withheld/withdrawn, but only around two thirds believed it would be sometimes morally right for nurses to comply with such requests. The authors hypothesized that nurses may condone the autonomous request from patients and the compliance of nurses with this request in different ways. Longer years of practice experience and being regularly religiously active were significantly associated with the feeling that withhold/withdraw treatment was not morally right. In a French study, Peretti-Watel et al. found that, in the case of patients with amyotrophic lateral sclerosis, 44% and 27% of the surveyed district nurses supported systematic intubation and tracheotomy, respectively, without considering patients' consent necessary. The authors found that both intubation and tracheotomy without patients' consent were more supported by nurses who did not systematically discuss end-of-life issues with terminally ill patients, and by those who stated that patients should never be asked to make a living will. Finally, the Ethicatt study  disclosed that, on average, 53% of nurses from several European countries and Israel would act at least "sometimes" against a competent patient's wish to refuse treatment if they believed that the patient would benefit, with significant differences between Northern and Southern nurses, who were less likely to follow the patient's wishes. In our study, nurses' attitudes were strongly associated with their background personal beliefs about the right to self-determination and the importance of quality of life in withdrawing treatment decision-making. These findings were in line with previous studies disclosing that patients' wishes and quality of life are among the most important nurses' rationales for limiting life-sustaining treatment [22, 23, 25]. However, it is worth noting that the rate of nurses who agreed with the doctor's decision, and factors associated with this attitude were similar in both scenarios, notwithstanding they strongly differed in both patients' age and prognosis, which are reported in literature as the other two most relevant nurses' rationales for limiting life-sustaining treatment [22, 25, 28, 29]. This may suggest that for participants in our study these contextual factors were less important than patient's wishes and quality of life. As expected, a positive association was found between the belief that one is influenced, in professional practice, by others' behaviour and the agreement with the doctor's decision to continue treatment. In contrast, the lack of association between participants' attitudes and the belief that "a nurse's personal values may influence the care provided at patient's end-of-life" was somewhat unexpected. However, in the interpretation of this result we should consider that in our study the statement regarding personal values did not refer to one's own experience, but generally to "nurses". Another interesting finding of the study was the gap between beliefs and attitudes towards self-determination. Indeed, while 83% of nurses supported a general right to self-determination, around 40% of them agreed with the doctor's decision to not comply with patient's wishes in both scenarios. Unfortunately, we did not ask participants to justify their attitudes, but several hypotheses may be formulated to explain the inconsistency between beliefs and attitudes. A possible explanation may be that, since the refused treatments were not futile, for many nurses the professional duty of care should overcome the principle of autonomy in both cases. In addition, even if most nurses acknowledged the value of self-determination, it may be possible that, for some of them, a deontological reasoning prevails when dealing with a patient refusal of essential treatment, or that, according to Dawe et al. , nurses have different ways of considering an autonomous request from patients and their own compliance with such a request. An alternative hypothesis was that some nurses could be more subordinate than others to doctors' decisions or, in general, less inclined to disagree with them. The positive association between the agreement with the doctor's decision and the belief that, in professional practice, others' behaviour influences their own, would support this hypothesis. Finally, some nurses, even if they respect patient autonomy, might be less willing to comply with a decision made by the patient outside any shared decision-making process. Besides the lack of a qualitative section, main limitations of our study were that we surveyed nurses from a single hospital, and that they responded to scenarios, not real practice. Strengths of our study were the high response rate, the consideration of different care settings, and the simultaneous exploration of both attitudes and background beliefs likely influencing attitudes. Even if, due to the limitations of the study, generalizations to Italian nurses should be made with caution, the results of our study may have important implications in light of the influence of attitudes on professionals' practices regarding end-of-life care [15, 30]. Indeed, according to our results, a patient's request to forgo essential treatment would cause, in practice, huge divergences among nurses and between nurses and doctors, potentially leading to substantial frustration for those nurses feeling that they have to act contrary to their own beliefs . This uncomfortable situation may be particularly burdensome in the Italian context, in which physician-nurse collaboration regarding end-of-life decisions is still scarce [19, 31]. In addition, providing some novel insights about how personal beliefs, independently from demographic and professional characteristics, may influence nurses' attitudes regarding end-of-life decisions, our study highlighted the need for further investigations to better understand how healthcare professionals deal with patients who decline treatment, and which factors underlie their attitudes towards these challenging situations. In this perspective, the present enquiry may provide a starting point both for further comparative analyses in the highly heterogeneous Italian health world, and for research aimed at disentangling the roles of the factors involved. The results of our study showed that, despite their deontological and juridical commitment to defend and respect patient autonomy, many nurses have difficulty in accepting a competent patient's request to forgo treatment. However, it should be considered that patients' refusal of treatment involves not only the professional and ethical dimension of healthcare providers, but also their feelings for the patient refusing treatment as well as concerns and reflections about their role in the situation . Moreover, even in countries in which the competent patient's right to refuse treatment is well established by law, it was raised the question of whether patient autonomy has the degree of importance often advocated in theoretical ethics literature . In this perspective, our results may suggest that, rather than call for legislation on patient's consent to treatment in Italy, there is a need for a more intense ethical discussion of end-of-life issues during nurses' professional education, in order to train nurses to manage possible conflicts between their own personal beliefs and the patient's rights. In addition, introducing ethics consultation services in general hospitals, and increasing the opportunity for healthcare professionals to discuss endof-life decisions, along with interventions to strengthen the physician-nurse collaboration, would be essential to develop a consistent and respectful manner of addressing end-of-life decisions in Italian general hospitals. The authors thank all the participants to this study. They also thank Emma Gilmore for her kind help in revising the English text. 9. Committee of Ministers of the Council of Europe. Convention on human rights and biomedicine. Brussels: Council of Europe; 1996. Available from: http://conventions.coe.int/Treaty/en/Treaties/Html/164.htm (Accessed 31 January 2015). 10. Ivone V. Advance Directives Regulation in Italy: Between Consent and Legal Rules. In: Negri S. et al (Eds) Advance care decision making in Germany and Italy. Berlin- Heidelberg: Springer Verlag; 2013. 11. Federazione Nazionale Collegi Infermieri. The nurses' de-ontological code. IPASVI; 2009. www.ipasvi.it/static/english/the-nurses-deontological-code-2009.htm. Received on 20 February 2015. Conflict of interest statement: The authors declare that there is no conflict of interest. No financial support was provided for this study.